Now that the frame is done, I can start adding stuff to it. 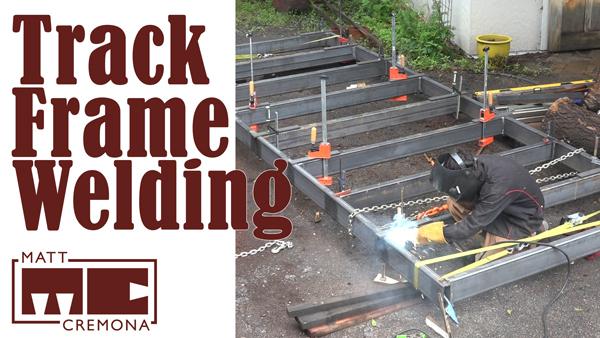 There is a pair of tracks that will guide the carriage and the cross members of the frame get capped with a piece of stainless square tube for the logs and cants to rest on. The runners are going to be held down to the frame with 3/8″-16 socket head cap screws and a washer. In order for this to work, there needs to be two holes: and access hole at the top big enough for the head and washer to pass through and a clearance hole on the bottom for the screw threads to pass through. I used the same hole template that I used to mark the hole locations on the cross beams to mark the hole locations on the runners. 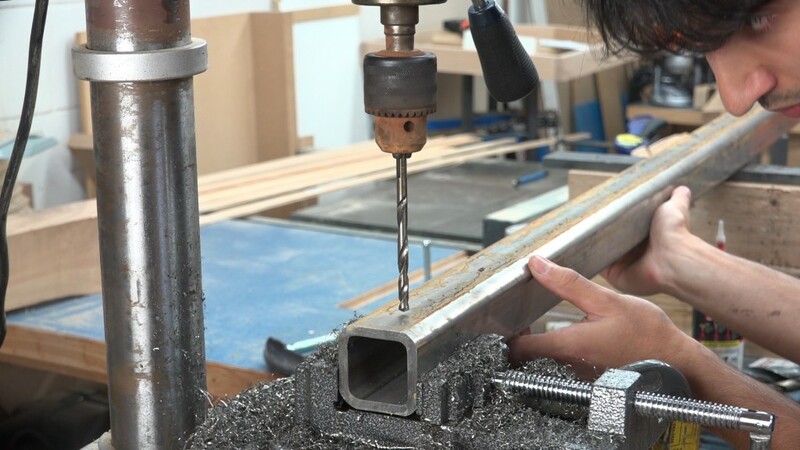 The divot created by the center punch can be carefully aligned with the point of the drill bit and the runner can be locked in place in the vise. 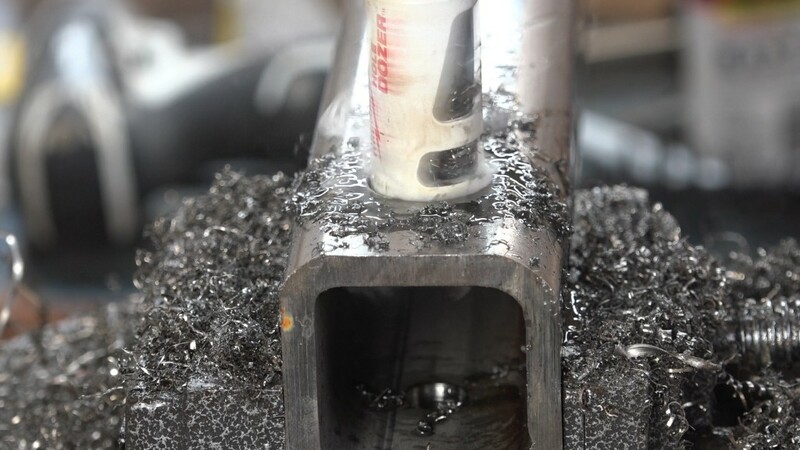 In order to keep the holes lined up from top to bottom, a hole can be drilled though both the top and the bottom with the same bit an without rotating the piece of square tube. I used a 1/4″ bit for this since that’s the size of the pilot bit in the hole saw that I’ll be using for the bigger hole. The side that is facing up is the underside of the runner. This hole needs to be enlarged so that the threads of the screw pass through it. I oversized this hole to provide a little extra wiggle room in case the holes don’t line up perfectly. I drilled this hole out to 7/16″. Next with a 1/2″ bit, I created a bit of a chamfer around the hole. 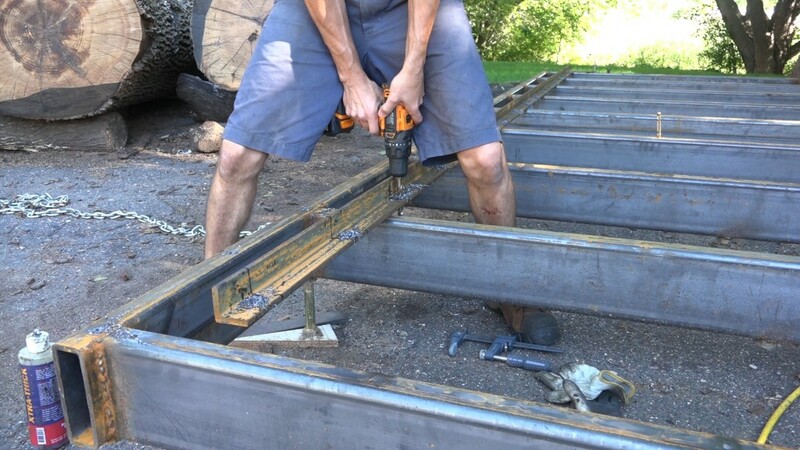 This removes any bur and will hopefully help the runner be pulled tightly to the frame. 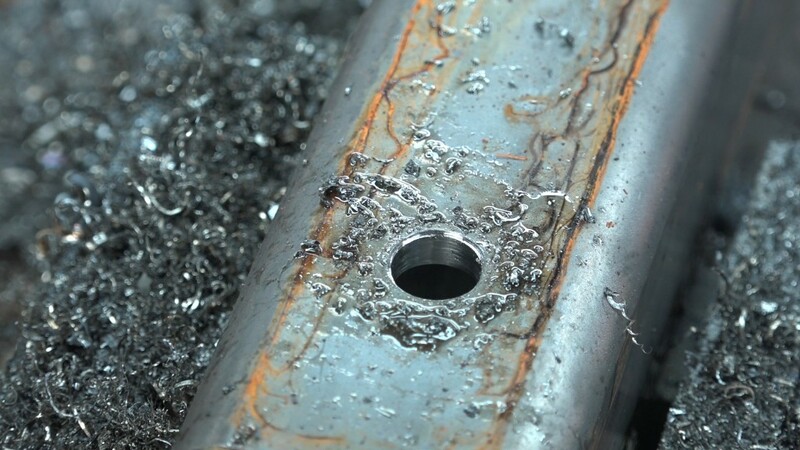 After rolling the tube and realigning the bit, a 7/8″ hole saw can be used to drill the larger clearance hole. I’m also adding a chamfer to this hole. This will make the hole less sharp and should prevent things from getting caught on it. The track is a piece of 2″ x 2″ angle with a 3/8″ thickness. They get attached to the side rails with bolts to allow the tracks to be adjusted into parallel. 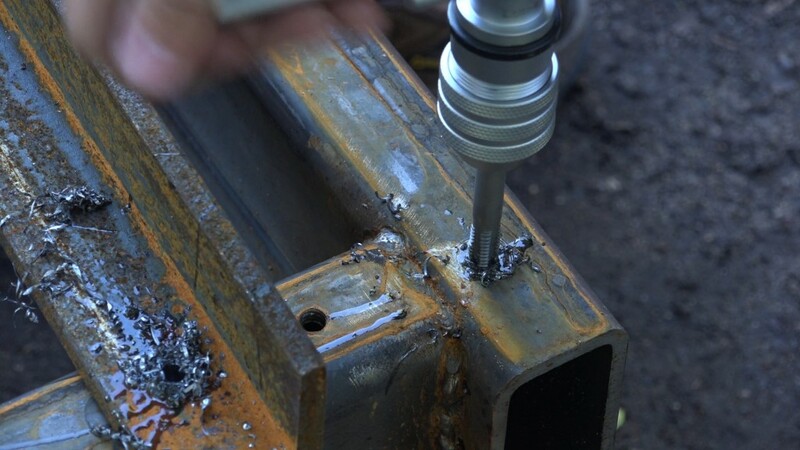 The track piece is clamped down to the side rail and a pilot hole is drilled through both parts. I went with a 1/4″ bit here. 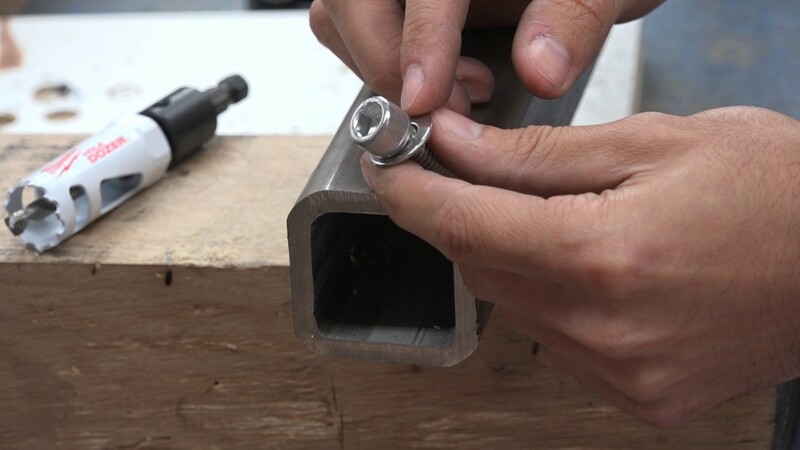 Next the hole in the frame can be enlarged to 5/16″ and tapped with the 3/8″-16 tap. And lastly, the hole in the track can be enlarged to 7/16″ to allow for some adjustability. I decided to add a bolt at each intersection where the side rails meet the connecting rails of the frame and then one in between each center rail. That came out to be 17 bolts down each track or 34 total. I drilled all the holes with my Triton T20 drill and went through 2 batteries and was on my third when I finished. The basic track construction is now done. I do have a few additions I still need to make to it. Being a little forward thinking, I know I’m going to have high stress applications at the center of each end rail, so I’ll be adding some more 2×6 tube to brace those parts. 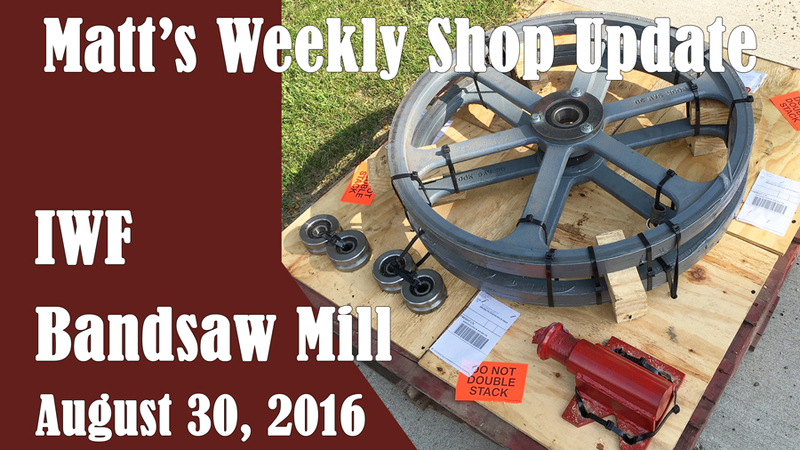 On one end of the mill I want to have a winch mount so I can pull log off of my trailer and onto the mill. On the other end I’m planning to have some sort of removable hitch so I can move the mill around they driveway with my truck. I’ll also add mounts for small removable wheels to the opposite end. Next up is the carriage! 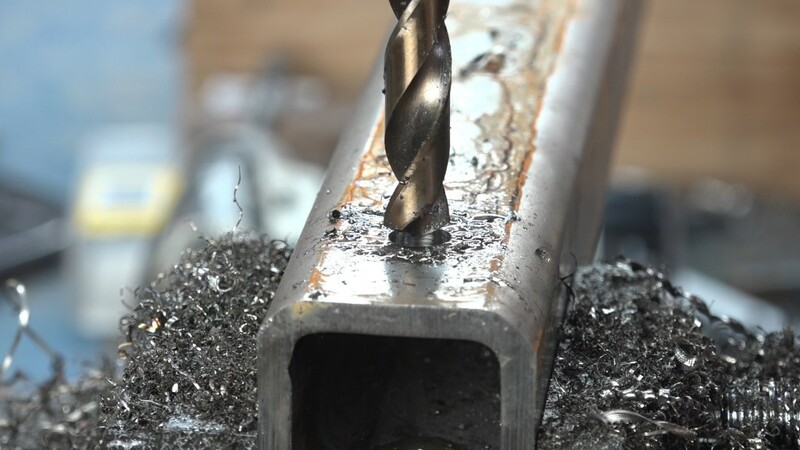 You might want to consider using a center drill bit when you start drilling your holes in the metal tubing. 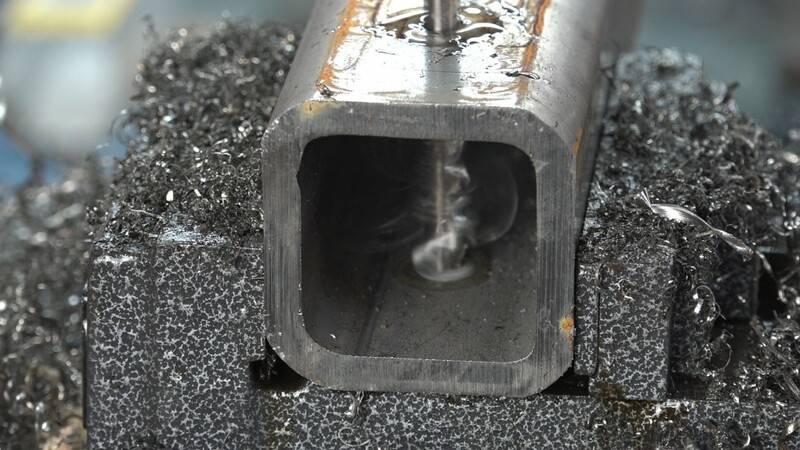 This will keep your drill bit from wandering. 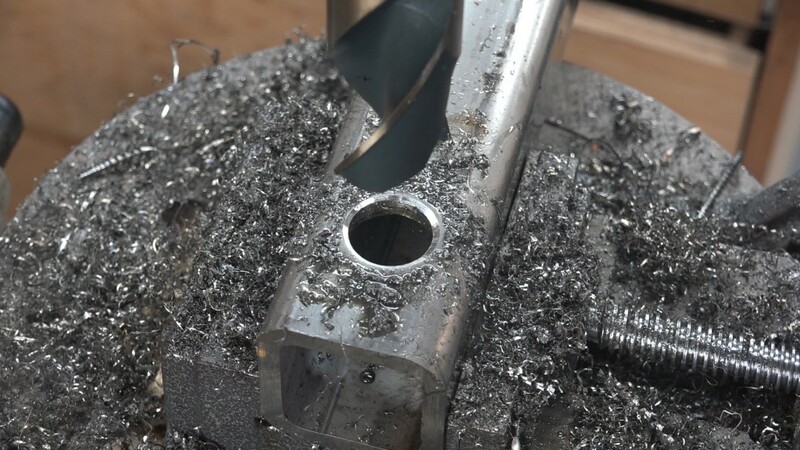 You also might want to use a counter sink to remove a burr from the hole save wear and tear on drill bits, in my opinion they work better than a drill bit. Looks like you have a good start on your project. I’ve never seen anyone use a center drill on a drill press but maybe I just haven’t been exposed to it. Luckily I didn’t have any issue with the bit wandering. It found the dimple from my punch and drill correctly. That would need to be a pretty big counter sink. I’ll have to look for one. I’ve never seen one that big. Thanks! 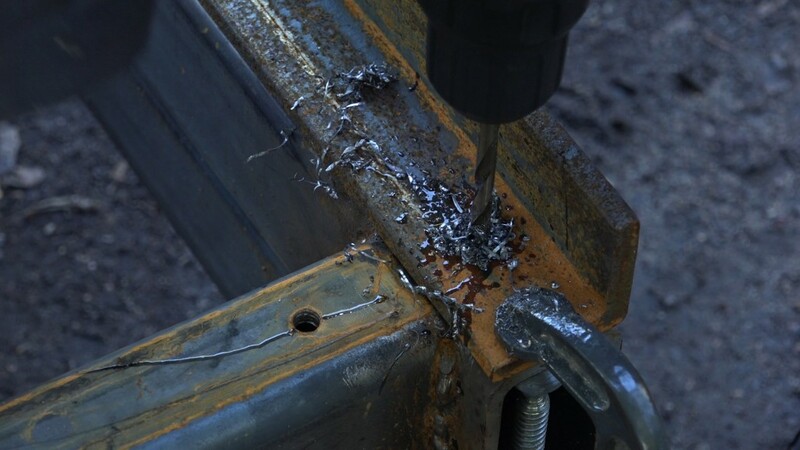 Hope you used hardened bolts as that would reduce rust issues? 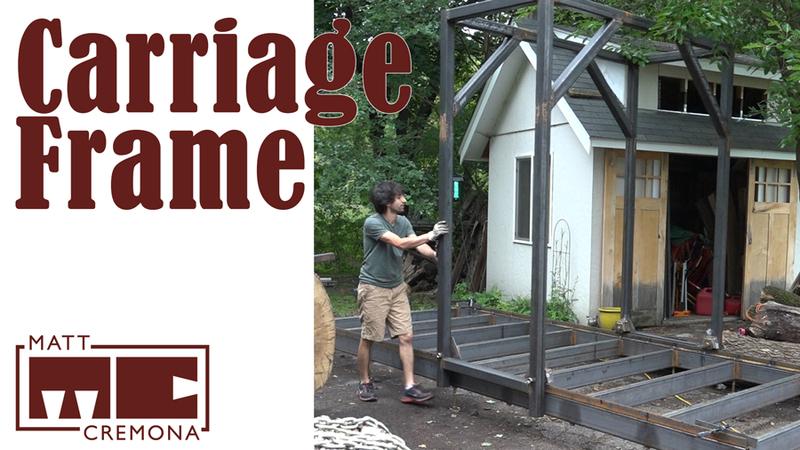 I also commented on YouTube that you’re getting to be a maker vs. just a woodworker? And your getting pretty proficient as a machinist. LOL! Watching you drill out all those holes reminded me of days just standing at a drill press drilling holes in steel parts, many, many days. So I had a thought and an idea to pitch to you. 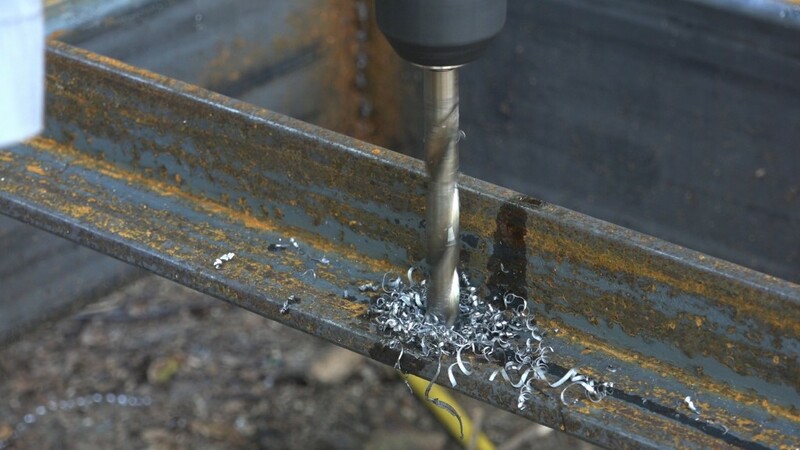 Since this enormous steel sculpture you’re building will be sitting outside you may want to consider using a product called “Never Seize” it’s a paste you brush on the threads of bolts to prevent them from seizing, especially when the bolts in question will be exposed to the elements. I learned about the stuff when I worked in the shipyard as a welder and now I use it when ever I am working on a project that will be exposed to the weather, I even use it on the lug nuts on my vehicles. You can brush it on the threads and even if you don’t turn that bolt for a few years when you do come back to it to remove it the bolt will move when you put your wrench on it. You can usually find the product at welding supply or industrial supply shops. It looks great I can’t wait to see this thing completed. Nice lawn mowing by the way.